Windows Media Centre is a fairly complete package out of the box, but what separates it from many other non computer media centres is that it offers the freedom to customise it to suit your wants and needs. While the TV guide looks nicer than many others, the ability to replace channel names with channel logos will really make your media centre stand out. My Channel Logos is a program that lets you replace channel names in your Windows Media Centre TV guide, with logos of the channels. Not only is it easier to recognise a channel logo from a distance, it makes the guide more appealing and easier to use. My Channel Logos has become a must have program for anyone who uses Windows Media Centre. The helpful community are making new logos as new channels become available, so there is very little work for you to do. It is as simple as installing and running it. My Channel Logos will detect which channels you have in your Windows Media Centre and populate the logos where available. If there are channels that don’t have an available logo, you can easily add your own by clicking on the empty box and selecting a picture from your picture library. 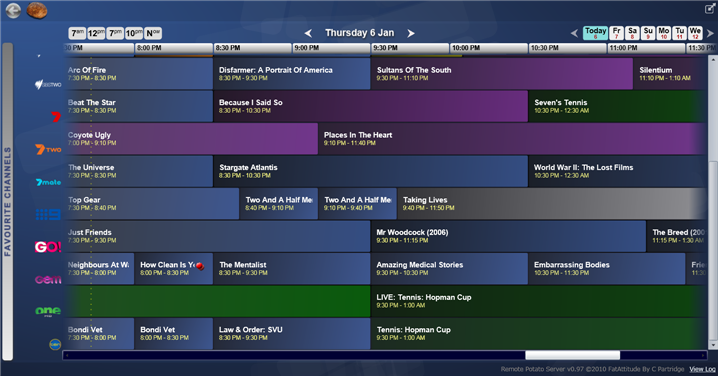 My Channel Logos can also be used by Remote Potato to show the logos in its own TV guide. If you use Windows Media Centre, it is well worth your while to invest the 5 minutes required to install this tool. I have found My Channel Logos to be flawlessly reliable and easy to use. There is no need to run this program each time Windows starts. Once My Channel Logos has entered the data, Windows Media Centre retains it and the only reason to open the software up again is to make alterations. My Channel Logos runs on Windows 7 Media Centre and is available for free (donations welcomed) from My Channel Logos.